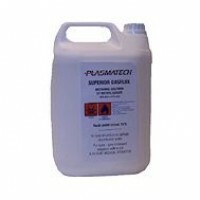 Supplied in the traditional larger economy sized 5 litre containers, our Superior Liquid Gasflux is a colourless, flammable liquid containing a special blend of Methyl Borate and Methanol. Superior Liquid Gasflux is also a cleaning agent and as such has consistently been proven to provide operators with improved productivity through less down time and reduced costs for the repair or replacement of equipment. Supplied in traditional, larger economy sized 5 litre containers, our Superior Liquid Gasflux is a c..